In the vast world of online casinos that support Bitcoin, BitStarz is definitely one of the few operators that are making a difference on the scene. A casino known for big wins and big player competitions, BitStarz often stands out from its competitors by creating a world of its own where players can immerse, stay busy, and reap the rewards for doing so. One of the latest expansions to this world is the addition of new islands to BitStarz’ unique Treasure Island player world but also the entry of a new player to the casino’s hall of memorable wins. A few days ago, the casino announced that another slot player was able to get extremely lucky at the slot games and hit a major win of 19.955 BTC on a single game. Only this time it was BetSoft’s Greedy Goblins slot that brought the payout. A 5-reel, 30-payline Bitcoin slot that sports BetSoft’s easily recognizable 3D graphics, the Greedy Goblins comes with free spins, bonus rounds, and a progressive jackpot prize that can be won with a single winning combination. And despite what its name suggests, the slot proved to be very generous last week when it brought a $148.0263 payout in BTC equivalent to one lucky Bitstarz player. Like many times before, the identity of the player isn’t revealed but one can see the username “maxmax31” listed in BitStarz’ “Top Winners” list. And what’s even more impressive is that this payout comes only a week after an Australian player struck the mother lode on an iSoftBet slot game and won a $45, 876 prize. 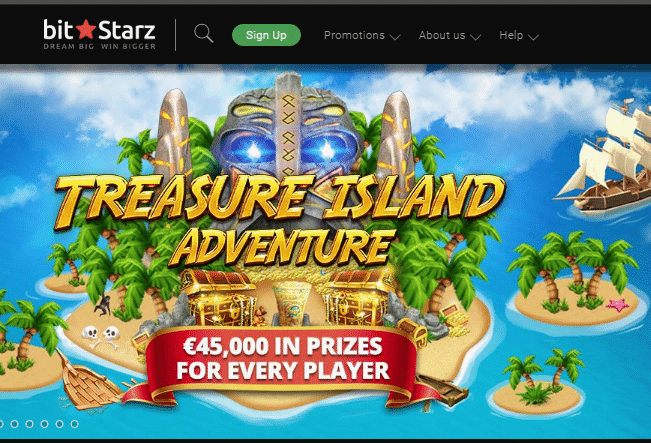 When BitStarz launched the Treasure Island at the end of last year, the casino was likely not very sure about how popular the unique competition will be. But after several months of running the tournament and attracting many of the casino’s players, the Treasure Island became a staple at the casino. And now BitStarz has decided to up the stakes and improve the competition with a new way of distributing rewards. Namely, unlike before when players had to compete against each other to win the Treasure Island’s prizes, now each player will be fully entitled to a €45,000 prize pool without having to share any of it. To make things even more interesting, BitStarz has also added new islands to the map through which punters can now progress. And sure, there’s no iPhone X to be won this time but you do have whole islands of prizes all for yourself. The Treasure Island promo runs on a monthly basis and this leg will last until April 30th, after which the casino might decide to make new changes to the promotion or not. The beauty of it is that there are no special requirements to take part in the promo other than that you have to log in and play games using your Bitcoin balance. And as you play more, you will progress through the various parts of the island, earning different rewards with each new level you reach. To learn more about the unique competition or try out BetSoft’s Greedy Goblins slot game, just visit BitStarz Casino and check out its offer.